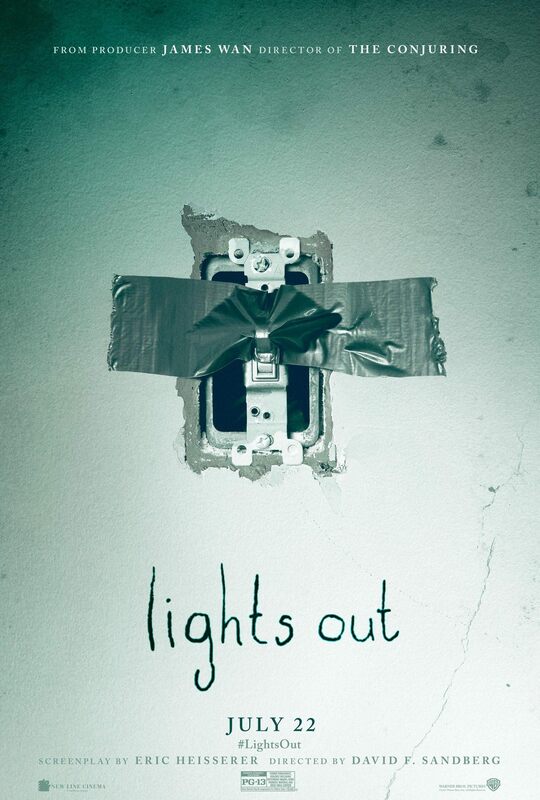 Lights Out is kind of an interesting counterpoint to many of this summer's other movies. Several of them have been needlessly long, running more than two hours. This one is a lean-and-mean seventy-five minutes, minus the end credits. Like The Shallows, it delivers thrills without needlessly prolonging anything. Also like the Blake Lively shark movie, it has a strong female lead in a sea of male-dominated fare. There isn't a whole lot here you haven't seen before, but it's well done nonetheless. Teresa Palmer plays Rebecca, a commitment-phobic young woman whose boyfriend Bret (Alexander DiPersia) tries hard to wear down her resistance. His efforts get put on the back-burner when a family crisis erupts. Rebecca's much younger half-brother Martin (Gabriel Bateman) is being neglected by their mentally ill mother Sophie (Maria Bello). When she steps in to take guardianship of the boy, she discovers that he's been seeing an apparition named Diana – the same one she saw as a little girl. Diana is a light-averse spirit that seems intent on terrorizing Rebecca for trying to get Sophie help. Lights Out utilizes things that have become standard in modern horror pictures: flickering lights, shadowy figures stalking people, a creepy basement, and so on. What differentiates it (slightly) is the idea that Diana can only exist in darkness. That means the characters have to move around to find snatches of light in order to escape her. During the third act, Diana ensures all the lights in Sophie's house cannot be turned back on, and there's great fun in watching the characters find alternate light sources. Everything they come up with is perfectly logical and plausible, which automatically makes Lights Out smarter than many similar movies. There are a number of decent jump moments in the film, courtesy of director David F. Sandberg, who also made the short on which this is based. Shots of Diana looming in the darkness are eerily effective. Every time a flash of light momentarily blanks her out, you scan the screen, waiting to see where she will re-emerge. At the same time, there's a good human element behind the chiller material. Palmer and Bello both give solid performances, and Eric Heisserer's screenplay intriguingly weaves in a backstory about Sophie's mental health issues and how they have impacted her children. The explanation of Diana's history is intriguing, too. While the short running time ensures that Lights Out never drags, there was still some room to expand on everything. Ninety minutes isn't unreasonable for a picture of this sort. More time spent on the Rebecca/Bret pseudo-romance would have strengthened its admittedly predictable payoff, and some kind of individual story arc for Martin would've been welcome, too. As is, the poor kid is more of a plot point than a fully fleshed-out character. Lights Out arrives on Blu-ray and DVD on October 25. Aside from a digital copy of the movie, the only bonus feature is a selection of deleted scenes that run about fourteen minutes. The first two are fairly inconsequential, although they do expand upon the relationship between Rebecca and Martin a little bit. The third, and longest, is an entirely different ending to the film. The way the story resolves itself -- and the way that the final battle with Diana is staged -- is far less satisfying than what ended up in the theatrical cut. The filmmakers made the absolute right choice in scrapping it. That said, it's definitely fun to see how the movie might have ended. Picture and sound quality on the Blu-ray are first-rate. Lights Out is rated PG-13 for terror throughout, violence including disturbing images, some thematic material and brief drug content. The running time is 1 hour and 21 minutes.